For a while, it looked like Jeff Fultz might just have the car to beat for the second week in a row, as the NASCAR Southeast Series traveled to Houston Motorsports Park. 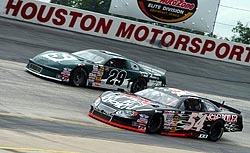 After starting a disappointing 10th, Fultz quickly maneuvered his way through the field and found himself battling for the lead with Dusty Williams. 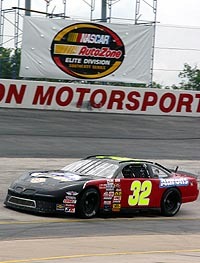 At lap 82, Fultz took the lead for the first time and proceeded to pull away from Justin Diercks and Jason Hogan. However, just a few laps later, sparks began to reign from underneath the car. They got worse, and then worse, and then even worse. Eventually, the left front tire went down, forcing Fultz to come to the pits and sending him a couple of laps down and out of contention to win. “The more we ran, the more it came on,” said Fultz. “The car was really good and was coming on even better the longer we ran. We got up through there and we were just being patient. We finally did what we normally do; we got to the front. “Then, the car started scraping more and more and made the car really tight. We were still pulling away though because the intervals were opening up. After the race, the team found out that the tire was slowly losing air from the start of the race. And for Fultz, it wasn’t just the long trip to Texas and the ninth-place finish that had him frustrated. Justin Wakefield has an eventful night on Saturday at Houston. The youngster, coming off of a career-best second-place run at Greenville last week, started second and quickly moved into a battle for the lead with local driver Kenny Bumbera. On lap 12, Wakefield got into Bumbera coming out of four and got the local guy crossed up. The two touched again and Bumbera went spinning and Wakefield worked on saving his #98. In the mess, Dusty Williams took over the lead. Wakefield continued on and worked his way back toward the front, beating and banging, eventually getting up to fourth by the end of the 150-lap race. Local Texas racer Kenny Bumbera had to feel the pressure on Saturday night. The hometown Houston driver wasn’t only competing in his only SES race of the year, but he was put on the pole for the event after the eight-car invert and had to lead the 19-car field to the green. Bumbera did just that, then led the field for the first 11 laps before getting a bump from second-place Justin Wakefield, causing Bumbera’s #0 ride to spin. Some skillful driving kept Bumbera off the wall and in the race. By the end of the night, he worked his way back up to seventh. “I got touched and turned around and I couldn’t save it, so that put me to the back,” said Bumbera. “That bump in the rear was right out of no where. I was kind of surprised about it. “I usually do better from the back anyway. It was just a lot of real tight, three-wide racing out there. These guys are professional though and you can run door handle to door handle and not get taken out. Without the spin from the lead, Bumbera wasn’t sure if he could have continued to lead, but he would have liked the shot. “I had a good car and good people behind me,” added Bumbera. “The car went away because the tire pressures were too high. I would have dropped back I think. I don’t’ think would have won it, but I think that I would have had a good, top-five car. I would have given it my best though. Charlie Bradberry was a little nervous heading into Houston Motorsports Park. It was the one track on the schedule that most everyone else had a year’s experience at already when the series visited there in 2005. He, however, hadn’t been to the 3/8-mile track before this past weekend. Turns out it was his equipment that he should have worried about more than his competitors. stayed on the bottom, you couldn’t get by them very well. It is just so tight. It is really tight. It was fun though. With the fourth-place finish, coupled with his second at Greenville, Wakefield finds himself second in the points, just five makers behind Jason Hogan. “It is a good start to the season. Hogan has a second and a third though and I want to be in first. I would like to shoot for top-fives every week. If we could do that, I’d be really happy. That is how you win championships. 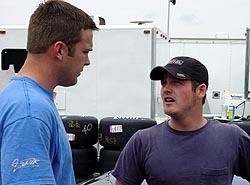 Justin Wakefield (right) and Dusty Williams (left) talk before the race at Houston. 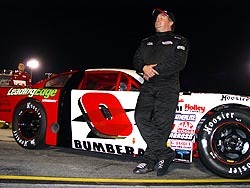 Bradberry was working his way through the field from his 15th-place starting spot and had gotten all the way up to sixth before mechanical problems cost him a couple of laps in the pits and a shot at his first win since returning to the series full-time in 2005. “We didn’t qualify as well as we would have liked to, so we had to come from the back of the pack, which was a chore at a place like this,” said Bradberry, the 2003 Southeast Series champion. “We came up through the field and got to about fifth or sixth. As Bradberry and the rest of the SES drivers found out on Saturday night, bringing the car home in one piece at the tight, one-groove track was tough. “You can be the best driver in the world, but here it is a certainty that you are going to run into people. This is just a tough short, short track. “This is a place where trying to stay out of everyone’s way is tough. One time, I tried to get up there and get my lap back. After I couldn’t, I figured that it was best just to drop back and try to keep the car in one piece and bring it home and finish the race rather than get taken out. Bradberry finished 11th, two laps down. He now sits sixth in the point standings, just 45 out of the top spot. 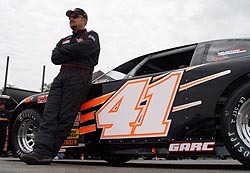 For Texas-native Robert Richardson, the date of May 7th had been circled on his calendar since the NASCAR Touring Series schedules were announced this past winter. 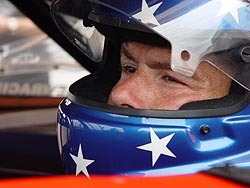 That was the date that the rest of the Southeast Series drivers would make the trip his way, into his home state, and battle at Houston Motorsports Park. Usually it’s Robert making the long trip east, but this week the rest of the competitors in the series headed west. Bradberry messed up on his qualifying run, then had more problems come race time. After a weekend and a race filled with all kinds of obstacles, Richardson was able to hold his head up high Saturday night by picking up his first top-10 finish of the year with an eighth-place finish. 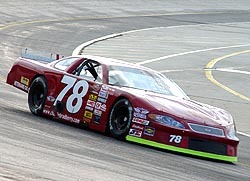 Richardson had to come from the back not only once, but twice, and still managed to claw his way into the top 10 before the 150-lap race was completed. With a little bit more time, a top five was a definite possibility for Richardson. Then came the first of Richardson’s two spins, neither of which were his own doing. On lap 26, Richardson went for a spin after slight contact with Greg Pope. After that spin, Richardson was able to grab a gear and keep himself on the lead lap since NASCAR didn’t throw the caution. Richardson then went for a spin again on lap 86, when he got sandwiched between two other cars while making his way back to the front of the field. Again, Richardson was able to grab a gear and keep from going a lap down on the tight, 3/8-mile track. He got back into the top 10, buckled hood and all, before the night was over. “We spun out and I was lucky enough not to get creamed by anyone coming at me. I got around and grabbed a gear and kept on going. The car was real fast and we made up a lot of ground. I was surprised that we made up so much ground at the end of the race. The race went by a lot faster than I thought it would. With a little more time, we could have maybe grabbed a few more spots. We had a fast car. 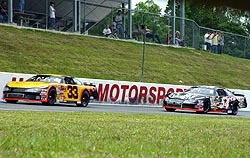 Robert Richardson (#33) out qualified Jeff Fultz (#54) on Saturday. Chris Davidson got quite a few cheers during driver introductions on Saturday night during the second Southeast Series race of the year. He also got a few boos. But that was because Davidson was finally racing at home. The one and only Southeast Series trip to Davidson’s homestate of Texas was just getting ready to start at Houston Motorsports Park. Davidson had a lot of expectations getting ready to start the race. He was starting ninth and felt confident he had a car that could finish in the top-three and maybe even win the race. And being close to home, winning his first SES race couldn’t come at a better place. One thing Davidson didn’t expect though was getting taken out of the running for the win just two laps into the event; and being taken out by one of his fellow Texas drivers making a rare start in the Southeast Series. “I don’t know what happened for sure,” said a disappointed Davidson after the race. “We were just on the second or third lap and we were passing people. The inside line was going and the outside line wasn’t. We had passed several cars and we were just getting ready to ride for a while. The 99 car (Michael Crofford) was pushed up high and he decided that he needed the position that I was in more than me and hit me a couple of times trying to get down in line when I was right there. That cut the right front tire down right away. While we were riding around with a flat tire trying to get to the bottom of the track, we ground the sway bar arm off and that was it. After the race, where Davidson finished 17th, 21 laps off the pace, he went down and talked with Crofford about the incident. “We just had a talk and decided who thought what happened and why it happened. I don’t think it will happen again. “There is no sense for driving like that early in the race. We race these cars every week. You can normally race 150-lap side-by-side with most people and usually not tear up your car. It seems like tonight, there were a lot of them tore up. It is frustrating when you have a good car. Running around for 100 laps on the apron of a race track can’t be fun for anyone. That is exactly what Kevin Prince has to deal with on Saturday night at Houston. “That was one of the longest races I’ve ever run,” joked Prince of the 150-lap affair that had to have seemed like 500 laps for the SES veteran. “It was a boring night. It was no fun at all out there. That is all you can do though. That is racing and there is nothing you can do about it. “We had a good car to start, but we got into the #99 (Michael Crofford) and bent the spindle and put it into the tire. Prince finished 14th, 10 laps down. Rookie Gary Helton was another victim of the close confines of Houston on Saturday night. And just like with Prince (and several other drivers during the night), contact with another car ruined his whole evening early. Helton made a green-flag pit stop at lap 23 to try and fix the damage. It was something that needed to be done. “You have to look out the left side window and try to get your reference that way when the hood gets bent up like that. It takes you a while to get used to that and it takes a while to get it fixed. It took just two races into his rookie season for young Michael Foy to earn his first career NASCAR Southeast Series top-10. And Foy did it by doing what a lot of others couldn’t do during the night, keeping his #32 out of trouble and pointing in the right direction. “It is not bad to run top 10 in just my second race,” said Foy. “We are taking it just one race at a time. That was our goal today was to finish in the top 10. So how did he get into the top-10 in just his second race?